During planning for the construction of a railway to cross the steep Rimutaka Range, cable and rack systems were both considered. Use of a cable system was rejected because all possible routes contained curves too severe for this method. The rack system, which uses toothed grip wheels and a centre rack rail, was not adopted because it was only in the development stage and had not been tested under hard-working conditions. Englishman John Fell’s simple friction-drive system, of smooth horizontal powered wheels on the locomotive held against the side of a raised centre rail, was chosen. 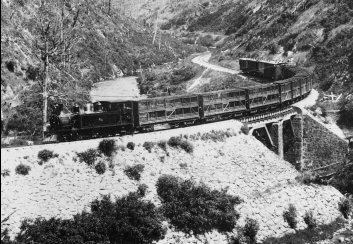 The fact that the Rimutaka Incline operated successfully for 77 years from 1878 to 1955 is testimony to the wisdom of this choice. A Wairarapa-bound goods train, hauled by a “W” class locomotive, pauses for its photograph on the bridge at Ladle Bend Creek, circa 1891. This view is looking towards Kaitoke. Source: Alexander Turnbull Library, Wellington. 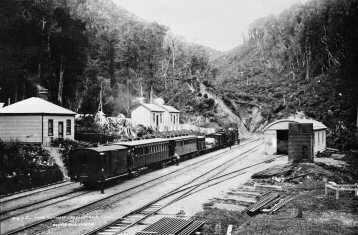 A mixed train is about to descend the Rimutaka Incline in this view of Summit, looking towards the tunnel entrance circa 1890. Note the railway cottages, engine shed and dense bush. Photo: Burton Bros., Dunedin. The exceedingly slow and labour-intensive operation of the Rimutaka Incline, together with the high cost of maintaining ageing engines, ultimately led to the construction of a tunnel under the range. The Incline was closed on 29 October 1955, being replaced on 3 November of that year by the 8,798m (5 mile 821 yard) Rimutaka Tunnel and associated deviation. 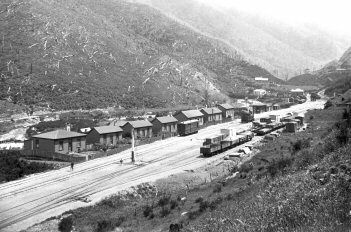 After closure of the Incline, buildings at Cross Creek and Summit were removed and rails and other fittings dismantled. Five of the six Fell locomotives were scrapped in 1957 at Silverstream, Upper Hutt. At the opening ceremony of the tunnel, locomotive H 199 was presented to the people of Featherston as a memorial to the men and women who for 77 years had provided the service over the Rimutakas. Taken circa 1910, this view looks across the railway yard and part of the settlement of Cross Creek. The beginning of the Rimutaka Incline can be seen in the background. Note the ganger’s house on the hillside and the school in the distance. Photograph: A.P. Godber. Source: Alexander Turnbull Library, Wellington.